MYRTLE BEACH, SC – You know you’re going to face a challenge when you’re greeted with “It’s playing tough, today.” Regardless of the set-up, the Palmetto course is still one of my all time favorite layouts. Even on its most benign day, it’s going to require you’re A-game. This beauty has everything. It has distance at 7015 yards (73.7/133) from the Blue tees, 6516 yards (71.4/130) from the White tees, 6009 (69.4/125) from the Gold tees and 5176 (69.7/116) from the Red tees. Although a big hitters favorite, the shot-makers among us are drawn to this great layout, too. You’ll hit every club in your bag and it’s imperative you hit them to the correct spot. On virtually every hole it’s more important where you hit, as to how far you’re hitting. Being off the fairway on any hole is a recipe for bogey, or worse. Although there are no forced carries on the Palmetto course, there are strategically placed fairway bunkers. Blend in water that frequently comes into play and a rough that can be very penal and you have the challenge that makes a great golf course. If you catch this one with the tees back and Sunday pin placements, you’ll have a round to remember. There are two things to keep in mind when playing the Palmetto course. Pay attention to the pin placements. The Bermuda greens are always in great shape, but with their undulation you’ll not want to leave long putts. Listen to the starter when he tells you to club-up. You will not enjoy the iron carry you enjoy at home when you’re play at sea level. It’s my practice to present a few holes on each course reviewed to share the character of the course through my average golfer eyes. It’s difficult to select just a few on the Palmetto course. Every hole portrays the character of this magnificent layout. From the White tees each of the Par 5s exceed 500-yards. No. 5, the No. 1 handicap hole brings everything into play. A sharp dogleg left tempts you to cut too much off the corner where a fairway trap awaits you. The perfect drive is center/left, but the big hitter needs to be cautious. I’ve seen long balls travel through the fairway and into the pond. A well-placed fairway wood should leave you a short iron into the green. As always, be aware of pin position. Do not leave yourself a long putt on any Palmetto course green. All Par 5s are three shot holes for the average golfer. Putt well and you’ll find an illusive birdie, or two. The Par 4 No. 14 is a favorite of mine. With water up the right side, keep your drive to left center. I know you’re bringing a greenside bunker into play, but the fairway does slope towards the water. I’ve seen good-looking drives that should be in the first cut, get wet. Of course if the pin placement is front left forcing a difficult downhill putt, you’re on your own. No. 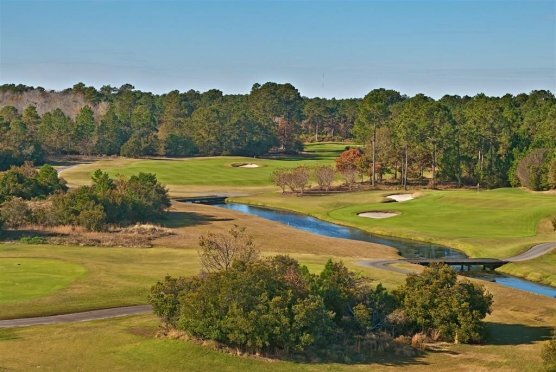 18 is a classic finishing hole with the Intracoastal Waterway on the left and a wide-open inviting fairway. A scenic and challenging finishing hole that makes you earn a victory, if you’re all even on the tee box. With the Par 3s it’s all about club selection. Pick the right club and make certain to get it to the pin. The Par 3s are well trapped and water does come into play on 3 out of 4. No. 11 does not have water, but at 190-yards from the White tees it has length. Remember to club up. In addition to sea level, you’re going slightly up hill. This one is well protected by large traps on the front sides. The green slopes to the front, so if you’re going to miss, miss short. No. 17 is also a shot-makers delight. Adjust to the elevation change on this hole and hit it tight. It’s a great birdie opportunity. The Palmetto Course at Myrtlewood Golf Club has been servicing locals and visitors for more than 30-years. There’s a reason it’s a favorite and in my humble opinion that reason is simple. This is a truly great venue and requires that you bring all of your game. From the tee box to the fairway to the short game and putting, you’ll need it all to conquer the course. Although few can do that on any given day, most average golfers appreciate a fair, but challenging golf course and will want to play it again and again. This one’s stood the test of time. If you have not played Palmetto course add it to your list. If you have played this one, you already know to do so.